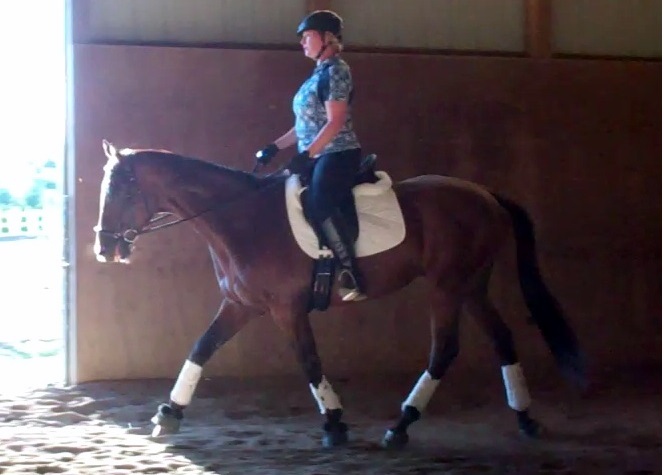 I still have a ton of work to do, but I’m struck by how my position influences the horse. Really, it’s probably no surprise. These animals can feel flies land on their hides. The shifts in weight and balance that we riders think are subtle probably aren’t, in reality. Now that I’m better balanced, Derby is moving forward much more freely. And without a lot of help from me, he’s also moving uphill. I tell you, once I get my act together, I’m going to have some fun with this sweet, lovely horse. Christy shot some video so I could see how we’re doing, and one thing really jumped out at me. While I sit fairly nicely circling left, the same cannot be said going right. 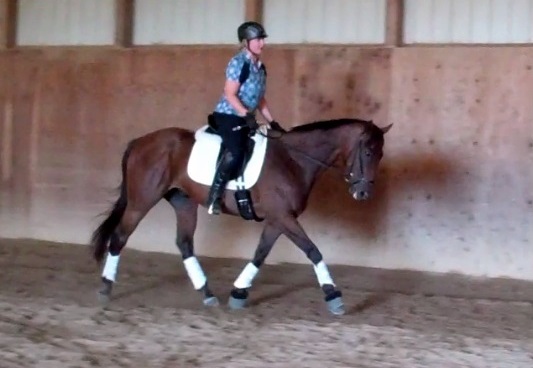 I am reverting back to the tendencies I exhibited earlier on Maddie – weighting one rein more heavily (the left one) and sitting crookedly (and unevenly) in the saddle. This video doesn’t lie. You can see me start to lean forward and close my hip when I change directions. This unfortunate shot sums up what we started to tackle in tonight’s lesson, in which we worked on overall balance and took aim specifically on correcting my crookedness. I have my homework for the weekend, and I hope to report good progress within a few days. 4 Responses to One week, redux. …the looseness allowed my SI joints to slip enough to hurt. Two weeks and multiple chiropractic visits later, I was no longer in such pain and finally allowed to ride again. HUGE difference. Anyway, my point is – now that my two years of struggles are miraculously cured by multiple visits to a doctor and NOT riding for a couple weeks, I am encouraging others to see an appropriate doctor/massage therapist if they think their problem may be more than just bad habits. 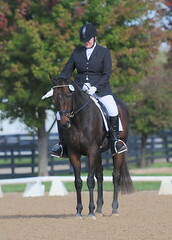 But it was just amazing to find out this 2 years struggle since I got back into riding was actually NOT my fault. So now I suggest everyone try out some sort of human bodyworker to make sure their problems aren’t due to physical limitations. I just have to say – I love that Christy gets you riding soft first before asking for more. I believe in suppleness as #1 most important thing before moving on to other work (other than when distracted and putting their minds to work, etc.) This is reflected in her riding videos, too. I like your trainer almost as much as mine! That’s great that you were able to find the solution to your issues, Annette. That had to be pretty gratifying! And yes, Christy does emphasize the basics, which why we’re breaking down and fixing parts of my position. If you don’t have suppleness, rhythm and contact, you don’t have much of a shot at any movements!